Classy, discreet magnetic hooks can be used on any magnetic surface: Whiteboard, magnetic board, steel cabinet, etc. 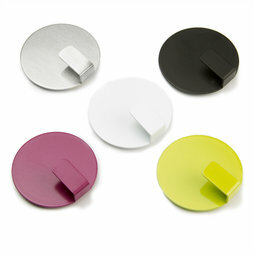 Thanks to the slip-resistant silicone surface, the hooks can hold even heavy objects without slipping off. A heavy bunch of keys is not a problem at all - and it may even serve as a clothes hanger for light clothing. Different from our pot magnets with hook, these magnets have a strong disc magnet glued to the backside. Therefore, they can't be compared to hook magnets based on their adhesive force, but they are much more elegant and available in several colours. These hooks make an impression as hangers for kitchen tools.